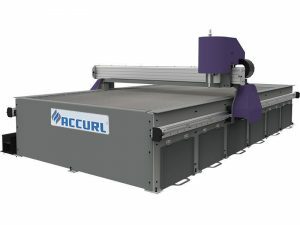 Laser Cutting Machine integrates optical, mechanical and electrical technology into one machine, which adopts laser technology, computer control technology and high-performance CNC (computer numerical control) laser power system. 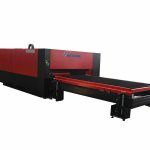 Laser Cutting Machine is capable of processing all kinds of sheet metal with high speed and efficiency. 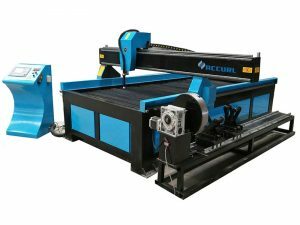 Laser Cutting Machine HECF3015IIIWJAT-2000 is applied in both metallic sheet and pipes cutting. The maximum size of sheet it can cut is that 3000mm×1500mm, the maximum size of pipes is that thickness 3mm, length 6000mm, round pipe Ф25-Ф160mm, square pipe 25mmx25mm-100mmx100mm (diagonal 30mm-160mm). The products will have smooth edge with high quality surface finish, small kerf width and little heat effect. 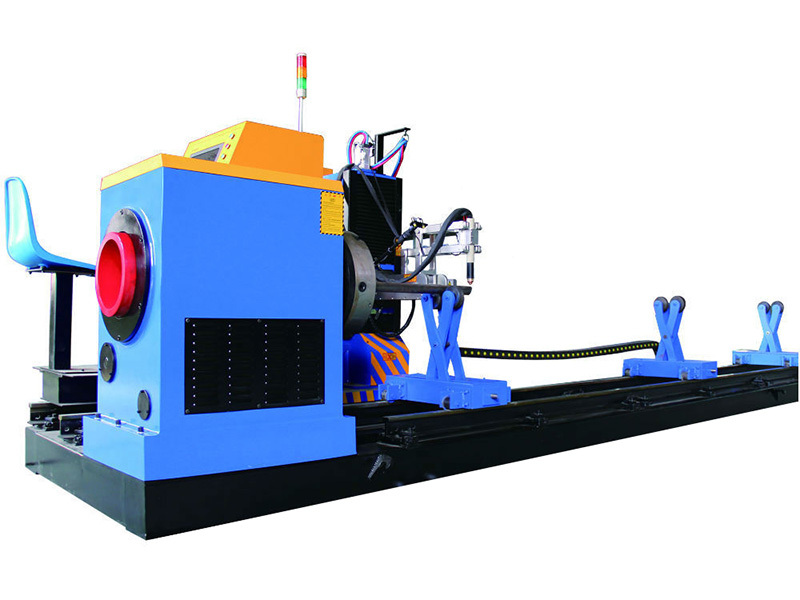 The machine is especially suitable for cutting metal sheet or pipe. 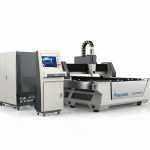 The Laser cutting head adopts German technology, equipped with QBH fiber output connector, special optical lens, sealed accurate focus adjusting method, and fast capacity transducer with minimum cutting gap 0.2mm, which could increase cutting speed and reduce gas consumption. The machine adopts gantry structure, beam and bed are in a single process with high precision, good rigidity, smooth operation. 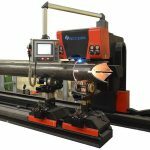 Machine base: The base uses the high quality welded tube and frame structure, through professional welding, secondary aging treatment, large precise gantry milling machine, precision machining, these designs and processing methods ensure the excellent shock resistance, high rigidity and stability of the machine. Deslagging system: The blanking collector is arranged at the lower part of the bed, which can remove waste and collect small parts during the cutting. Dust removal system: The work platform uses the dust collection design to remove the dust and exhaust gas. 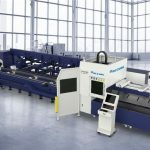 Automatic exchange worktables: Two automatic worktables can achieve a smooth and rapid exchanging, which shorten loading and unloading time, enhance cutting efficiency and reduce labor intensity. Encloser: Fully enclosed cover can maximally protect personal safety and reduce dust pollution. 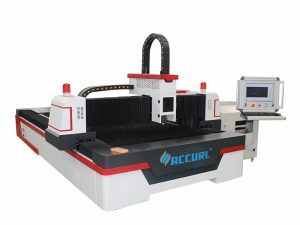 The machine tool adopts gantry double driving structure and high damping machine tool bed, with good rigidity which can suffer high speed and acceleration, Imported AC servo system and driver system, imported gear and rack transmission, linear guide track for guiding, to ensure the high speed, high precision and high reliability of the machine. 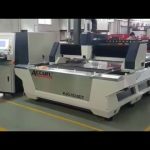 Fiber laser cutting system includes laser cutting process, normal stock layout function and laser processing control. 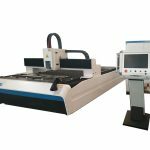 It mainly has drawing process, parameters setting, user-defined cutting process edit, stock layout, route planning, simulation and cutting control. 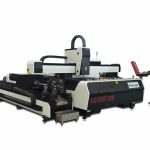 The cutting power could be adjusted with the cutting speed. The individual pull in and pull out speed could be set. It also has material process library, which could save all the process parameters for the same material. The coaxial red light is used as the indicator to make it simple to adjust optical system and more accurate to posit working point. The water cooling system is equipped and the temperature could be indicated. The water cooling system would start working automatically when the temperature is higher than the preset value and stop working automatically when the temperature is below the preset value. Rotary clamp can hold round pipe Ф25mm-Ф160mm, square pipe 25mmx25mm-100mmx 100mm (diagonal 30mm-160mm), with thickness 3mm, length 6000mm. Material supporting device can be kept stable for a long time to work. 1. 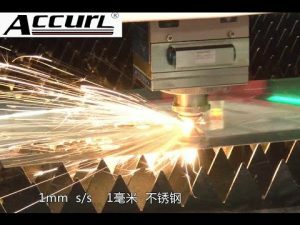 Excellent quality of light beam:small focus facula, fine cutting line, high working efficiency,best processing quality. 2. 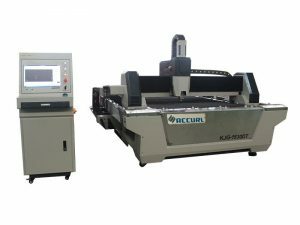 High cutting speed: 2 times by co2 laser cutting machine with the same power. 3. High stability: adopt world top imported fiber laser souce with stable proformance, key parts lifespan could be 100,000 hours. 4. 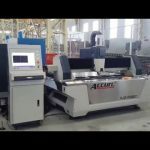 High efficiency of photoelectric conversion: fiber laser cutting machine is 3 times by CO2 laser cutting machine, energy efficiency and environmental protection. 5. Low using cost: fiber laser cutting machine power comsumption is only 20-30% of CO2 laser cutting machine under same power. 6. Low maintenance cost: without working gas for laser source; without reflecting lens for fiber transmission. 7. Convenient operation: do not need to adjust the optical path with fiber transmission. 8. 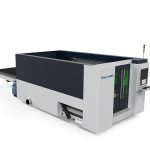 Strong soft optical effects: compact volume and structure, easy to operate flexibility. 9. Adopt Gantry double driving structure, high damping machine tool bed for higher speed and acceleration. 10.This model adopts imported AC servo system driver and imported transmission system, the moving structure of machine tool adopts imported gear and rack transmission, linear guide track for guiding, ensuring the high speed,high precision and high reliability of equipment. 12. 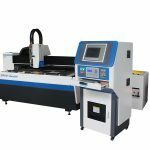 Professional laser cutting machine cnc control system, computer operation for precise cutting and convenient operation. The user shall provide good environment for the equipment such as level floor for equipment placement without strong motion, clean and dry environment without dust, 5-350C for equipment working. Working power supply should be provided: three-phrase five-line power 380V/50HZ. The user shall prepare air compressor (more than 0.6 square meters per minute for air displacement, more than 1.0Mpa for air pressure), hydrogen, nitrogen and distilled water for cooling use (about 70L).